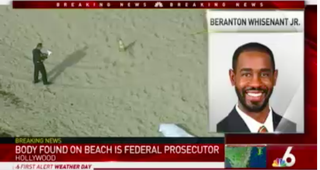 A federal prosecutor was found dead on a beach in Florida this week. Beranton J. Whisenant Jr. was found early Wednesday with possible head trauma caused by gunshot or other means, according to the Miami Herald. The 37-year-old had just joined the Miami U.S. Attorney’s Office in January and investigated cases of visa and passport fraud. The Herald reports that Whisenant worked in civil litigation for a Miami law firm but before that had served as a state prosecutor in Jacksonville, Fla., after graduating from the University of Florida law school in 2004. Whisenant was raised in Jacksonville, Fla., where he was raised by his parents, both medical doctors. He lived in Miramar, Fla., with his wife, Ebony, a physician, and their three children. His body was found washing up on the shore of Hollywood beach early Wednesday by a passerby, who told WTVJ that the body had been tumbling in the waves and still had personal items on it. It was not immediately clear if the lawyer died on the beach or somewhere else. The death is being investigated as a crime by the Hollywood Police Department. Read more at the Miami Herald and WTVJ.